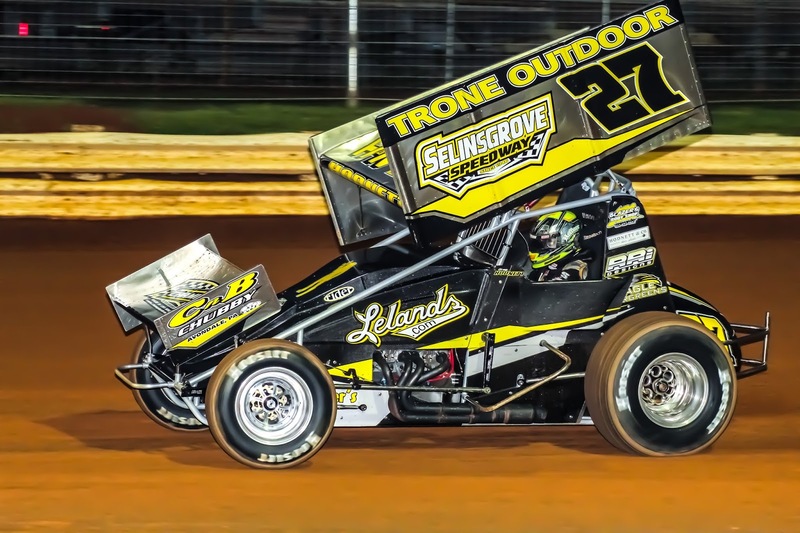 PORT ROYAL, Pa. – Port Royal Speedway is set to honor Greg Hodnett as a Living Legend coming up this Saturday, July 28 at 7 pm with the Living Legends Dream Race. Plus, the third and final Port Royal leg of the 2018 Moon Shine Camo Rt. 35 Dirt Late Model Challenge Series, paying $2,200 to win and $225 to start, is set to be staged as well. Hodnett will be feted at the event with a pre-race autograph session taking place behind the grandstand from approximately 4:45 to 5:45 pm. Joining Hodnett for the fan meet and greet will be current car owner Mike Heffner along with former car owners Al Hamilton, John Trone, Jim and Sandy Kline and Bob Stewart. Hodnett’s current ride, the Lelands.com No. 27 and his former ride, the Trone No. 39 now piloted by Cory Haas, will be on display behind the grandstand during the meet and greet as well. And then the Tennessee transplant driver will receive his Living Legend laurels on the stage following time trials. Special, limited edition Living Legend Greg Hodnett t-shirts will be on sale at the event as well as a way for fans to commemorate the special occasions. On the track, the sprint car drivers will be vying for a total sprint car purse worth over $55,000 with more than $30,000 alone posted for the 35-lap Dream main event. Twin 16-lap semi mains carrying full purses worth $10,000 each will set the A main starting grid. Nearly $3,000 in contingency cash will also be given away during the entire on-track event while a host of contingency prizes valued at another few thousand dollars will be distributed to racers simply for attending the event. Cash prizes include hard charger awards, fast time awards and a total of four bonus finishing position in the A main worth $200 each. In addition, lap 27 of the A feature will pay $200 to lead courtesy of Eagle Evergreens, in honor of Hodnett’s current No. 27 sprint car while the 12th finishers in both of the semi mains will receive a $200 bonus from Eagle Evergreens in honor of his former ride, the Apple Motorsports No. 12. Products and gift certificates will come from Hoosier Tire, Don Ott Racing Engines, Rider Racing Engines, DMI, Zemco Speed Equipment, Hank’s Performance Products, Mach 1 Chassis, Penske Shocks, Kreitz Oval Track Parts and Moose Blocks. Sponsors of the prestigious event include Slivinski Law Offices, Hoosier Tire, Penske Shocks, York County Racing Club, Boulevard Car Wash, Hoseheads.com, DMI, CRANKWERKZ, Rider Racing Engines, Don Ott Racing Engines, Zemco Speed Equipment, Hank’s Performance Products, Mach 1 Chassis, Kreitz Oval Track Parts, Bryan Imes Auctioneer, Rebecca Kerstetter Agency, Weikert’s Livestock, Tedd Reitz, Hazards Distillery, Moose Blocks and Eagle Evergreens. Greg Hodnett is the current Port Royal Speedway point leader as he and his Michael Heffner No. 27 team compete for a first-ever track title for both driver and owner. The personable Tennessee transplant has won all the big events at the track over the years including the: Tuscarora 50, Night Before The 50, season opener, Bob Weikert Memorial, Labor Day Classic, speedweek and the Dream Race itself. Hodnett currently has 52 wins to his name at Port Royal Speedway with that number sure to grow. He currently ranks seventh on the Port Royal all-time win list. Adult general admission for the show is set at $30 with students ages 12 – 18 priced at $15.